As part of the volunteer week, students made toys for local animal shelters. Photo by William Craine. Spring is in the air, and so is the spirit of giving back. Bradley Fellows hosted their annual National Volunteer Week this past week, offering a volunteer-related activity each day. According to Jessica Moreano, the volunteering committee chair for Fellows and a junior international studies major, the goal of the week is to increase awareness about volunteering on campus. From April 8-11, an event was planned for each day. On Monday, members of Fellows handed out cookies around campus. Other events throughout the week included volunteering at the after-school program at Lincoln Elementary School, a sexual assault awareness speaker, dog toy making and Midwest Food Bank food packaging. “I looked at different ways I could get Bradley students involved in the community, and I tried to have each event be in touch with a different issue,” Moreano said. 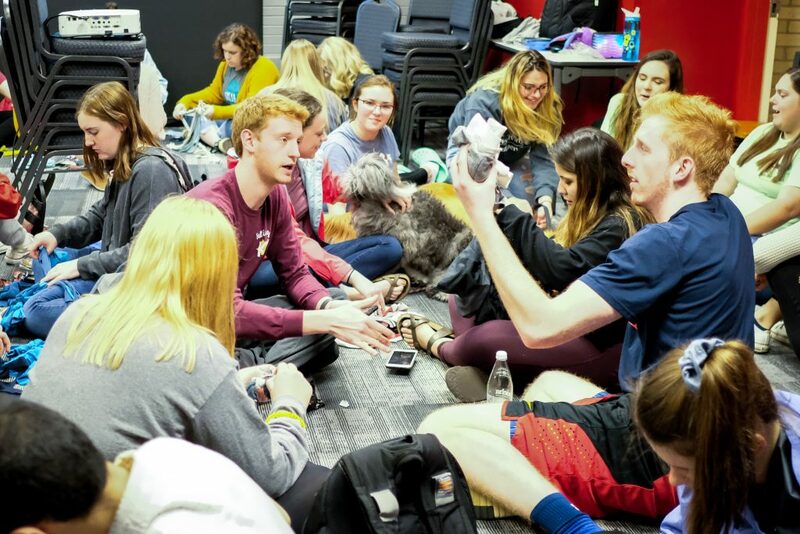 Sophomore international business and marketing double major Meghan Jacobson attended Thursday’s event, which included cutting up old T-shirts to repurpose into dog toys. Fellows partnered with other organizations like Bradley H.E.A.T. and Greek Life on campus to increase involvement. Fellows, according to the Bradley website “was conceived as a means for instilling leadership skills and civic responsibility.” In accomplishing this, each student involved is required to complete at least 40 hours of volunteering per semester.